Introduction: To describe injury type and frequency, and the factors influencing these, in endurance mountain bike riders. Method: This study used a cross-sectional retrospective audit of patient report forms, prospective meteorological information and race data over an eight-year period. The Australian twenty-four hour mountain bike championships is held annually in Canberra, Australia. All riders who presented to a first aid station for treatment during the race from 2000-2007, were included. Studied factors influencing injury were race time, ambient temperature and rider gender. Studied outcome measures were injury frequency, location, type and management. Results: Of the 14,777 riders over the eight years, 596 required first aid treatment for injuries (4.03%), the majority for minor injuries to extremities. Only 0.25% of riders were referred to hospital, 0.06% by ambulance. The injury incidence was 8.4/1000 bike hours with a race-ending presentation (a patient referred to hospital) incidence of 0.5/1000 bike hours. Patient presentation rates were highest in the first eight hours of a race. Higher average temperatures per year were associated with a greater risk of injury. Females were more likely to be injured. 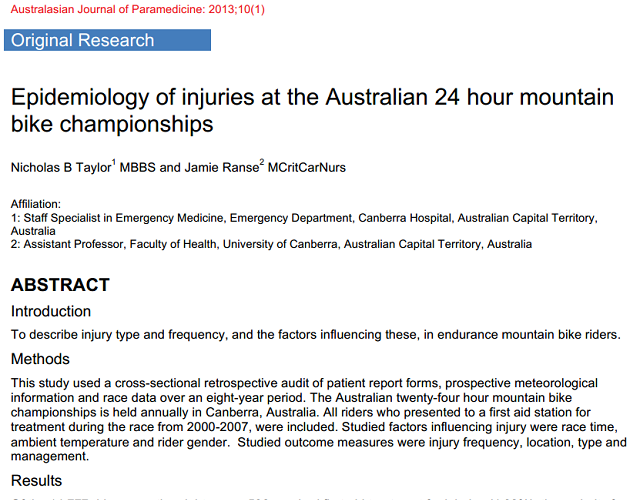 Conclusion: This mountain bike competition was safe with minor injuries to extremities predominating and low referral rates to hospital, as a result, first aid service organisations provided adequate clinical care at this event.